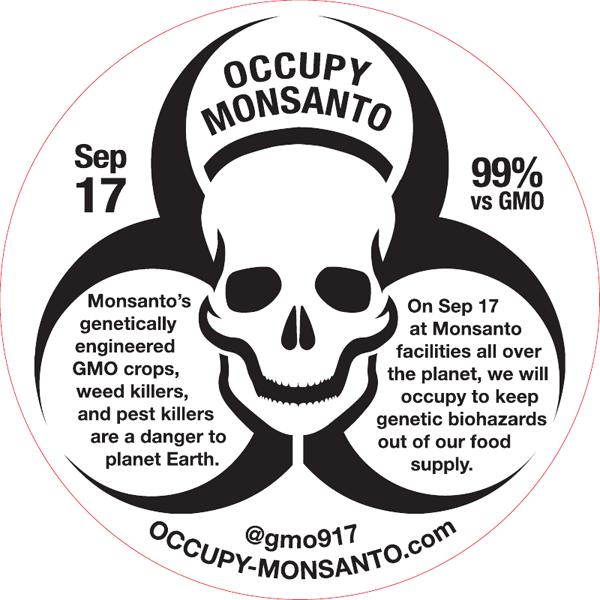 An expanding network of concerned individuals known as Occupy Monsanto has emerged over the past 8 months staging numerous protests at companies connected to the global trade of genetically engineered foods, also known as GMOs. The network announced today that on September 17, 2012 protests will begin for an entire week in St. Louis, home of the Monsanto Corporation, and across the US including California where voters will decide if they will label GMOs this election and worldwide in Argentina, Canada, Germany, India, Philippines, and other countries where concern over GMO impact on the environment and human health is growing. The protests will vary in size and nature but are unified in pushing back GMO food into the lab from which it came. An interactive map with times, dates and locations of the 60+ protests can be found at http://occupy-monsanto.com/genetic-crimes-unit/. “There is something wrong when a chemical manufacturer, the same company who made Agent Orange, controls the US food supply,” says Jaye Crawford, a member of the Genetic Crimes Unit in Atlanta, Georgia that has planned a week of events. Info: http://occupy-monsanto.com/atlanta-gcu-schedule-of-events/. Occupy Monsanto will be heard at the offices and facilities linked in the GMO food system. In St. Louis a major anti-GMO conference will take place in the same location as the ’12th International Symposium on GMO Safety.’ A lead organizer of the conference is Barbara Chicherio who believes, “Monsanto’s push to control agriculture and what people are eating poses a great threat not only to consumers in the US, but to farmers and communities throughout Latin America, Africa and Asia.” Info on the conference is at http://gmofreemidwest.org/. "In Our Backyard (A Monsanto Introspective)" : http://vimeo.com/6203466 . There have been “Sit-Ins” and “Be-Ins,” but there has never been an “Eat-In” at the Food And Drug Administration before. The purpose of the FDA is to “protect and promote” the health of Americans. Instead, Americans are being kept in the dark about the foods they are eating. In 2012, over a million people signed the "Just Label It" petition for GMO labeling and over 6 million Californians voted for honest labels, but the FDA has failed to act. There have been two petitions on President Barack Obama’s “We The People” petition website that have surpassed the signature threshold required for a response. But instead of answering the sincere concerns of the American people, there has been only silence. What: Eat-in for GMO Labeling at the FDA, Stone Soup Style. Jump on an action-bound bus from your region to the FDA! Pack a picnic, bring a bowl, spoon, & mug, and gather an arm full of (vegetarian) ingredients from your region to add to the GMO-Free “Stone Soup” were going to be cooking up. Come enjoy a day of sunshine with a picnic-style protest. Are YOU hungry for some food democracy? Where: Sidewalk outside of the Food And Drug Administration’s Center for Food Safety and Applied Nutrition, 5100 Paint Branch Parkway College Park, MD 20740. Located across the street from the College Park Metro Station (Green Line). When: April 8th 2013, 8am-6pm - All Day! On Monday April 8th, we’ll head to the FDA’s Center for Food Safety and Applied nutrition, to face down the institution that chooses Monsanto’s industrial interests over public health. Join this historic event to make our voice heard and to begin to take back our food system. Come before work, come for lunch, come after work! We'll be done with the “Eat-In” by sundown. 2.) Volunteer! Sign up to volunteer HERE or to have our organizers help organize a van from your area HERE. 3.) Tell someone else! RSVP on Facebook, share the event page with your network, & send reminders as we get closer to the date. For more information visit Occupy-Monsanto.com or contact StoneSoup@Occupy-Monsanto.com. Bring your veggies and we’ll see you at the FDA! West Virginia Contact: MorgantownFDAbus@occupy-monsanto.com to connect with folks traveling from WV. Massachusetts Contact: Boston - BostonFDAbus@occupy-monsanto.com North Hampton - NorthhamptonFDAbus@occupymonsanto.com to connect with folks traveling from MA. Georgia, Atlanta Contact: AtlantaFDAbus@occupy-monsanto.com to connect with folks traveling from Georgia. Wisconsin Contact: MadisonFDAbus@occupy-monsanto.com to connect with folks traveling from Wisconsin. Vermont Contact: VermontFDAbus@occupy-monsanto.com to connect with folks traveling from Vermont. Re. "Monsatan", a timely bump & I quote "In 2012, over a million people signed the "Just Label It" petition for GMO labeling and over 6 million Californians voted for honest labels, but the FDA has failed to act. There have been two petitions on President Barack Obama’s “We The People” petition website that have surpassed the signature threshold required for a response. But instead of answering the sincere concerns of the American people, there has been only silence." Thanx for your comprehensive information posting above. Seems hopeless I know. But petitions are only a small part of our efforts. Marches, boycotts have to be a part of this as well. This eat in is just another tactic. But we must always remember that we up against the most powerful, most evil force ever faced. Victory is not guaranteed, far from it. Much hard work and setbacks must be expected. "Monsanto Protection Act : A Post-Mortem for Our Legal System", by Clay Rossi : http://www.informationclearinghouse.info/article34482.htm . Don't lose hope ; the struggle is hard and the struggle is long but what's the option ?! And of course I maintain we must continue protests, boycotts, petitions, phone calls etc. Obviously we can't give up. As you imply 'giving up' is not an option - ever !! Democracynow is great info source. Listening now in background. We need you to stand up for safe healthy food! Vote out pro big Agri politicians, And Protest, pressure, & agitate for progressive change. Well Obama just put Monsanto VP in the FDA. So I guess that measn he's off your list. I can clearly see it.When all the other corporations have finally finished with us,we then front the Monsanto conveyor belt to be made into Soylent Green biscuits to be distributed to the rest of those living on each Tuesday. The problem is not Monsanto per se - indeed, it is a rare spot of light to see an industry dominated by a corporation still run from the U.S. Rather, I would say it is with our system of "intellectual property" which, in every way, tends to favor large corporations over small inventors, and by its nature tramples on the farmer in his field. What we need is a different way to make research and development a profitable enterprise that does not require people to give up their rights. We have reached a level of communication technology where it is actually feasible for every individual person filing a tax return to pay a surcharge, equal in aggregate to what is now paid in copyright and patent royalties, and specify which independent funding organizations he would like to disburse this money. These organizations could then do so, based on the merits of the technology, not on the volume of sales. So a company developing a new way to modify plants would be rewarded by organizations that judge the research worthwhile; also one that develops herbicide resistance, also one which carefully develops strains using only "natural" methods of selective breeding guided by genetic data. And we'd each be free to put down our money on the idea we like. There would no longer be metering of the quantity used - a farmer could grow a GMO crop (or a crop that receives stray pollen from a neighboring field) without needing to pay anyone. With such reforms, the worthy pursuit of genetic improvements in agricultural production could be pursued by small companies or independent inventors on an even footing, with no need to cross-license patents. In the end, it would be the taxpayers and those they choose to represent their funds, not lawsuits, making the call about who receives funding. It's the truth and you know it is, DM. You should spend your time pretending you have some friends in the world. OWS needs activists. Not pretenders. You are doing what the 1% do, by manufacturing consent. You've already been busted for doing it, and you're still doing it, you dickhead. You think we don't all see you doing it? What a cockhead you are, if you don't think we all see you voting for yourself. Then their is the problem of the fact of growing poison crops to keep the insects at bay - Ummm - I am pretty sure that that kind of thing is hazardous for other life as well - Like Human Life. Anyway the insanity must end. HI DKA, You made some good points here. Yes, another painful mechanism of control. Maybe everyone should store some seeds (good seeds). I would strongly recommend it for anyone with access to real ( unadulterated ) seed. An appeal to protest to get involved is always worth a positive response. You would think. Not always. But I suppose I frequently respond to people I know will object. But I suppose I frequently respond to people I know will object. Then don't respond to them. Make a comment ( positive comment ) for a healthier world for all and leave it at that. Those who want to - will look at the comment and take it for what it is worth - or they will look at the commenter and disregard the comment. Example : Trashy will never get approval from me as he/she/it(?) has burned itself repeatedly - so anything trashy says is suspect of being a new strategy of BS. Simple. yes. you are better at that than me. We are all flawed. Together. And together we will cancel that out and agitate for change. I just read the Bighead1883 comment below & got a chuckle over his soylent green reference.